Dear, listen, I say open your mouth." so wide when I say that. instead of serving foods to my mouth? Fast foods like Nigiri-zushi, Unagi-no-kabayaki, Tempra, Oden, Soba, Udon were made popular in mid Edo and then after. Sushi was served in stand at first. 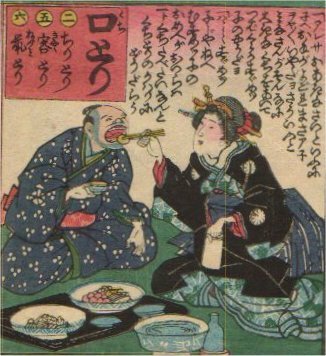 The current style of Sushi appeared in Bunka period first, its original way of cooking was, seasoning and stewing sea eels, cuttlefishes, shrimps with Soy sauce or other first, then put them on the formed rice cake. Raw fishes like spotted shads or horse mackerels were eaten at the end of Edo first, then tunas from Meiji era, fat part of tunas from Taisho era.